Sam joined our coaching team in April 2018. He is known to the club as he has a swimmer background. He also competed at British nationals for Swansea Aquatics back in his university days. He then moved into a coaching position initially for Swansea, then shortly after moving on to Pembroke. His capacity for success continued to develop having produced British national qualifiers, Welsh national champion qualifiers and medalists as well as numerous West Wales medallists. 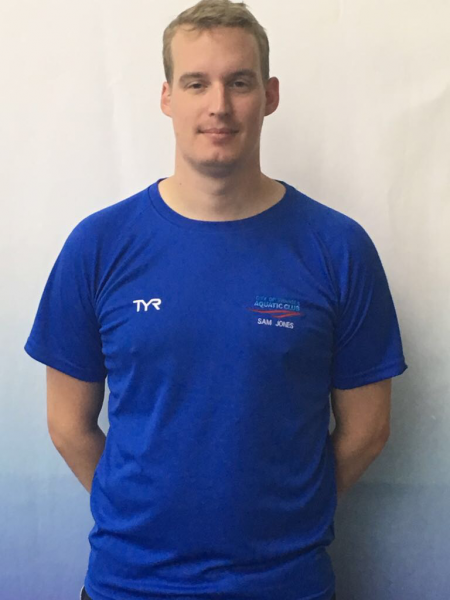 He has worked with Commonwealth youth swimmers (1 of which finished 5th individually), as well as with a bronze Commonwealth Games medallist, IPC European silver medallist, European youth gold medallist, 2 British national record holders, several British national champions and nationals finalists. He also has an aptitude for Sports analysis and biomechanical movement, working with senior positions in British Swimming. Using Analysis software Dartfish in aid of analysis feedback sheet used by coaches for skills and tactics. Independently giving feedback on over half of the races analysed using Dartfish Software on the Paralympics swimming races in Beijing 2008 Completed the course in sports analysis from the performance analyst. Sam will be overseeing and delivering a Land Training programme in addition to his Assistant Head coach and Coaching role.